This week we have a review of the latest mystery by Kristen Lepionka featuring her modern private investigator character Roxane, who happens to be bisexual, and a great Pride related guest post from Kristen about the need for more LGBTQ+ mysteries. 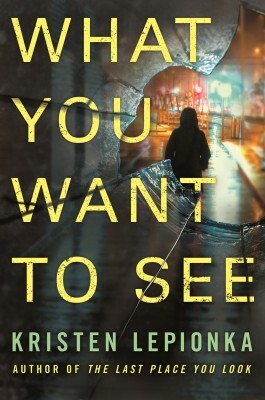 Details at the end of this post on how to enter to win a copy of What You Want to Seealong with a link to purchase the book from Amazon, and an indie bookstore where a portion of the sale goes to help support KRL. Roxane Weary is a private investigator whose life comes with lots of emotional baggage. This time she is hired to follow an engaged woman whose fiancé thinks there is another man in the picture. When the woman is found murdered, Roxane’s client becomes the prime suspect when the police discover that the couple had a very public fight just before the murder. Is Roxane’s client really guilty, was it a mugging gone sideways or something else? The more Roxane digs into the classy woman’s background, the more complex the case becomes. It appears the murder victim, Marin, had multiple prior marriages, a grown son just out of prison and a criminal record of her own. Roxane’s investigation leads her to a crew of cons who are thieves, a family of organized crime figures, a scam defrauding elderly victims of their homes, and the suspicious accident suffered by an elderly woman who lived just down the street from the murder scene and knew the victim well. This second in a new series was a complex and enthralling read. I read it in one setting because I couldn’t stop until I knew the answers to all the crimes committed. The characters are well written with depth and well defined personalities. The various story lines are well thought out with lots of characters, clues, and false leads that lead to a shattering conclusion that will have you on the edge of your seat. I consider this a must read for any crime or mystery fan who likes a taut and thrilling adventure. You can check out my review of the first book, The Last Place You Look, and an interview with Kristen, here. I used to think that writers must get inundated with emails and social media messages from fans, and that hearing “I liked your book!” loses its charm after a while. Then I published a book and was on the receiving end of those emails, and I realized that it doesn’t. There’s actually nothing better than hearing from readers—not in an ego-stoking way, but because making a connection to someone who’s read my work and felt something from it, is just so freaking cool. Especially when it’s a queer reader writing to say they love my queer private investigator, Roxane Weary. When I get a note from such a reader who enjoys the portrayal of Roxane as a complicated, modern private investigator character who happens to be bisexual, I sometimes jump up and down with happiness while in line at Starbucks, excitedly call my girlfriend to tell her all about it, or enthusiastically write back with so many exclamation points that the reader is probably like, “whoa.” Sometimes all three. Okay, usually all three. Why? Because I wrote the book I always wanted to read, and it turns out that a lot of other readers have been wanting that too. You see, I decided to write The Last Place You Look because I always wanted a mystery featuring a bi detective whose sexuality is just a backdrop to her character, not a plot point or her defining characteristic. As a person who identifies as bi myself, I hate the way bisexuality is portrayed in pop culture as a joke, or a kink, or a way of implying that a character is dishonest, untrustworthy, unfaithful. Yes, there are certainly bi people who are all of those things, but only because people are all of those things. A bi person is no more likely to be unfaithful than a straight person or a gay person. I actually wrote about this at length for Salon recently, and the comments section quickly became a wasteland of “you should be happy there are bi characters at all” and “but bi people just seem like cheaters”—two thoughts which wholly comprise the vicious circle I was arguing against. Because if pop culture continues to spread this type of thinking, people will continue to believe it, and so on. Meanwhile, bi readers who enjoy crime fiction constantly see this caricature of their identity bandied about as truth, and that’s awfully unwelcoming. This is not to say that there are no queer characters in crime fiction—there are a number of excellent ones, from Joseph Hansen’s Dave Brandstetter to Ellen Hart’s Jane Lawless, to the works of Michael Nava, Ann Aptaker, Jeffrey Round, Mark Zubro, Renee James (who KRL is interviewing the end of this month), Katherine V. Forrest, etc. Whenever I talk about this, I always worry about sounding dismissive of the contributions of others to queer mystery fiction by saying that there aren’t nearly enough LGBTQ+ mysteries out there. But there aren’t. What we have is groundbreaking, but still only a tiny fraction of the books in the genre as a whole. Queer mysteries are often saddled with that label—“queer mysteries,” as in, only for queer readers—as opposed to mainstream mysteries featuring queer characters that all readers can enjoy. This summer, in addition to the release of my second Roxane Weary mystery, What You Want to See, I also have the honor of seeing The Last Place You Look nominated for the Anthony Award and the Shamus Award for best first mystery novel. I’m thrilled to be recognized in a wildly talented field, and I’m also overjoyed that a book with a bi main character is nominated—I’d be happy about seeing that even if I hadn’t written it, to be honest. In celebration of Pride this month, I hope you’ll pick up a book by a queer author. And if reading it makes you feel something, consider dropping the author a note to tell them. After all, that’s why we write—to feel–and why we read in the first place. To enter to win a copy of What You Want to See, simply email KRL at krlcontests@gmail[dot]com by replacing the [dot] with a period, and with the subject line “see,” or comment on this article. A winner will be chosen June 16, 2018. U.S. residents only. If entering via email please include your mailing address (so if you win we can get the book sent right out to you), and if via comment please include your email address. You can read our privacy statement here if you like. BE SURE TO STATE WHETHER YOU WANT EBOOK OR PRINT. Kristen Lepionka is the author of What You Want to See (May 1, 2018; St. Martin’s/Minotaur) and “The Last Place You Look” (June 13, 2017; St. Martin’s/Minotaur). 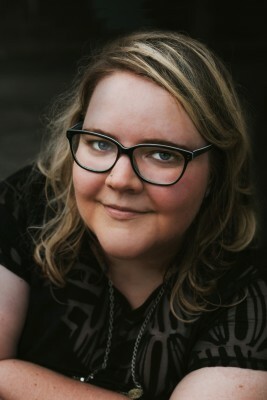 She is also the founding editor of Betty Fedora, a feminist crime fiction magazine. You can visit her at kristenlepionka.com.